On Sunday, Trevor Bayne won the Daytona 500 in just his second NASCAR race. I watched most of the race and it may be the only car race I watch all year. And that is why NASCAR is losing the ratings war. You see, I am the sports fan they should be targeting — avid sports fan, male, age 18-49 — and for some reason they are missing terribly. I even have a favourite driver. A few years ago I decided I wanted to get into NASCAR, but I needed a driver to root for. Without a driver representing my home town or current town, I did what any sane person would do. I made a spreadsheet ranking all the drivers in various categories such as how much I like their main sponsor and what colour their car is. Clint Bowyer won. His sponsor at the time was Jack Daniels. You do the maths. Of course, now his sponsor is Cheerios. Considering I now have two children, it is as if we have a connection. Or he is mocking me, but I digress. The point is, I may not watch another NASCAR race this year. Why? I’m not sure. But it doesn’t help that: a) even in HD, it is not easy to get a sense of how fast the cars are going on TV; and 2) those speeds are getting slower. In 1987, speeds of cars at the Daytona 500 peaked when Bill Elliot won the poll with an average speed of 210.364 MPH. That year, Elliot also won the race with the second-fastest average speed (176.263)*. This year, Dale Earnhardt Jr. won the pole with an average speed of 186.089, or 24 MPH slower than Elliot in 1987. And Bayne won the race with the second-slowest average speed…ever. 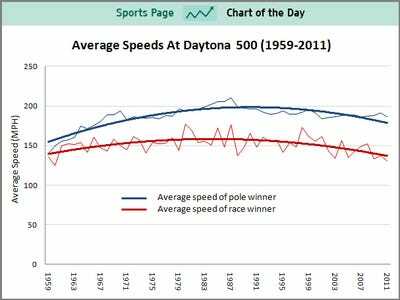 Bayne’s winning speed was faster than only the 1960 race (124.740). One reason for the slower speeds is restrictor-plates. 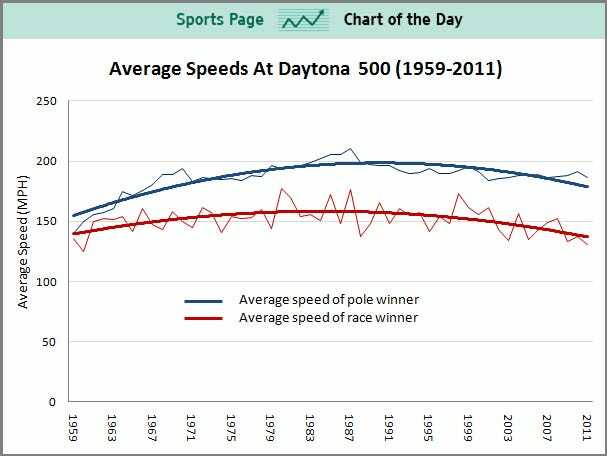 And of course, yellow flags have a lot to do with the average speed, and maybe that is something NASCAR needs to minimize. (Of course, the plates keep cars closer together, which leads to more accidents.) Like baseball, it is the downtime that makes the sport seem slow to the casual viewer, not the 100 MPH fastballs. Either way, I want to like NASCAR, but I don’t. That’s not my problem, that is NASCAR’s problem.